Tomatoes, meet your new friend, Basil. 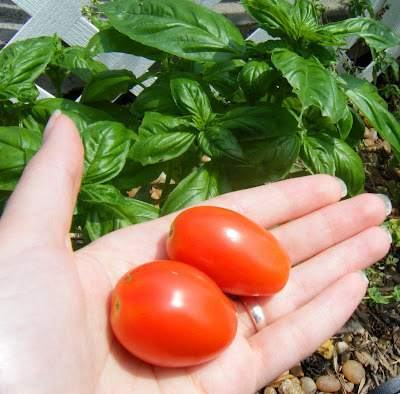 I gave one of these first two tomatoes to my next door neighbor. Who promptly ate it whole, in front of me. either you're an excellent photographer, or your basil just looks so totally much better than mine. Last year the two sweet basil plants I planted were each four feet tall by the end of July. I actually feel sort of inadequate this year. The heavy rain in May made me plant everything late. There's nothing wrong with your basil, I am sure, Rebecca. It just grows smaller in a pot.